Once again, there are Giants and/or Ogres through this entire level, and I'm not sure that I've gotten them all on the map. Assuming that you entered from the southwest the first thing to do is head towards the real southwest corner. There's a set of doors here, leading to a room here with a couple Guardians in it. For sheer frusteration, Guardians have to be the worst. They're invisble, like Black Shades, but they don't cast magic, so you can't even track their location by following the origin of the spells. Once you've killed both the Guardians head through the doors to the east. There's a chest in this room containing some of the possessions that Bruskrud asked you to recover. Head towards the northwest corner of the map from here. The passage meanders a bit, but you'll get there. Once you arrive you'll see a building. Enter the doors leading north, and be prepared for a battle on the other side. Once you've cleared this room head towards the doors leading north out of this room. In here is a Hill Giant Chief. Once you've killed him go through the doors leading west. You'll be attacked by some Hulking Worgs in this room. You might want to skip wasting a Piercing Crystal or spell points on this barrier, since there's nothing in the chests but a Healing Potion and an Energy Potion. Take note of the door going south near the western wall in the main room. This leads to one of the prisoners that Bruskrud asked you to free, but you can't free them until you've found a way out for them. Go through the doors leading east out of the main room, and then north into another guarded room. One of the chests in this room contain another set of possessions to return to Bruskrud. Leave this building to the south, and go back down the passage until it branches to the east. The building just to the north here is a temple. There's a Gazer and some Hill Giant Shamans guarding the area, and you should take note that Gazers will drain the spell points of your spellcasters. Once you've cleared out the enemies approach the altar. Get the items in front of it first, then get closer until you receive the message about the blade. If you choose to take it you'll spring a trap which will lock the portcullis leading into the temple, and start some Quickfire. There's a secret passage in the the southwest corner of the temple that you can duck out of. 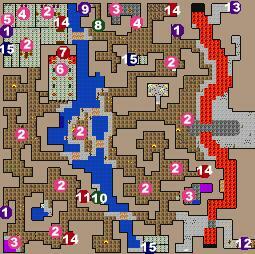 Once you're through the passage the Quickfire will disappear and the portcullis will reopen. Head down the main passage again, until you come to another passage leading east. This leads to an island with a few Giants standing around. Judging by the fact that they usually drop some Cheap Wine when I kill them, I'm guessing they were having a party. Since they didn't invite you, you should probably kill them. Go over the southern bridge to the east, and then make your way to the southeast corner, crossing the bridge over the lava. In the very corner you'll find a secret passage leading out. Don't step out yourself, since you won't be able to get back up once you do, but now that you've found the passage you can free the prisoners. Go back west of the lava and into the passage leading south. You need Dispel Barrier or a Piercing Crystal here, but there's another one of the prisoners in one of these cells. Go a little bit north once you've freed the prisoner and you'll come to a room with a door leading east. Through the door I think there might be another Guardian, though I'm not really sure. Head north up the passage again, veering east when you get the opportunity. In a long sidepassage off of one of the rooms is a third chest containing some of the items Bruskrud wanted you to retrieve. Now go back to where you can see the island and take the middle passage leading east. This will take you to the main entrance of the Giant's Cavern where they've quite nicely assembled a welcoming party for you. Once you've killed them head north along the edge of the lava until you come to a passage leading west. Instead of following the passage cross the lava and go to the northeast corner. This is where you'll find the ladder leading down the northeast section of the Lower Giant Caverns. Once you've come back up take the passage to the west that you just passed. There's some cells to the south with the last prisoner in one of them, and to the north is a Hill Giant Chief. When you kill him he'll sometimes drop a Dexterity Bracelet. The room behind him contains another Guardian. To the east of the door is a smaller room that contains a chest with the last of the possessions Bruskrud asked you to get. To the west of the door is an obelisk in the hallway, with a small niche behind it. In the niche is a secret passage leading to a boat. Board the boat and head down the river to where there's a beach. Get off on the beach and check the wall for a secret passage leading to a chest with a Blessed Small Shield. Once you've gotten the shield it's time to return to Lorelei to report to Commander Bruskrud, and then head down to the Concealed Tunnel to finish the Troglo/Giant quest. Don't forget to pick up your horses if you left them in the Giant's Forge.